During the 17th century, a style of embroidery known as raised work or stumpwork became popular in England. With its interesting mixture of techniques and motifs, it served as an advanced sampler for girls, incorporating more complicated techniques and trickier materials. Usually depicting Biblical or mythological narratives with characters quirkily rendered in contemporary dress, these embroideries exude charm and whimsy, and for an embroiderer, are abundantly full of beautiful technical details! 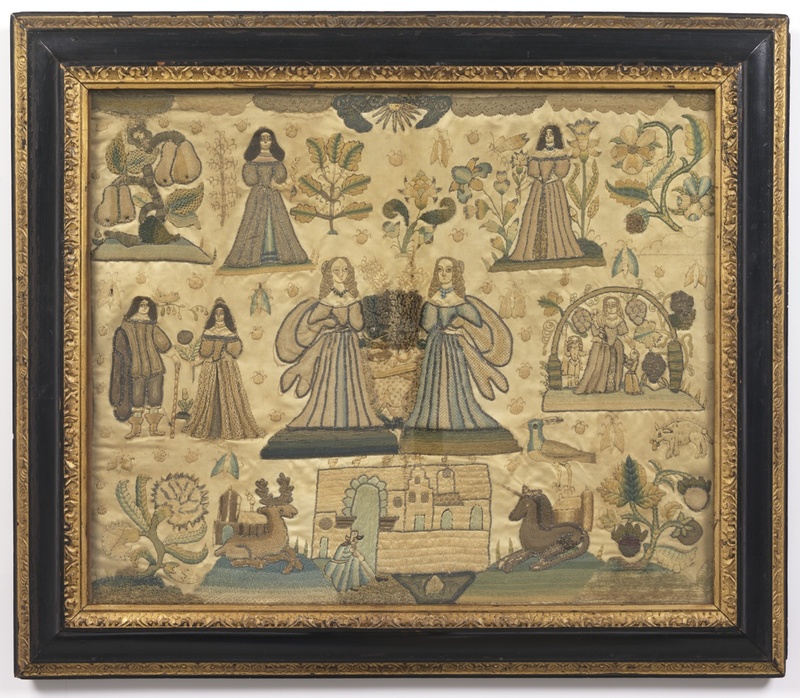 This embroidered picture incorporates many of the lovely techniques and materials commonly seen in 17th century raised work. Techniques on display include variations of detached buttonhole, flat silk worked in various stitches, metal threads, silk-wrapped metal threads, couching using both metal threads and silk gimp, and a few found objects if you look very closely! Since I find such joy in all the various techniques blended together on 17th century raised embroidery panels, I thought I would focus here on one of my favorite techniques — detached buttonhole. Detached buttonhole is a family of techniques where the basic buttonhole stitch is manipulated in various ways and is worked predominantly above the surface of the fabric. These manipulations allow the embroiderer to create the many different textures and patterns, including needle laces, as seen in the deer, the unicorn, the pears, and the dresses of the female characters (except the character beside the pear tree). Compare the detached buttonhole executed in a very open needle lace pattern on the gown of the small woman left of center to the tighter pattern of the right central woman’s gown. Or, by focusing just on the area of the pear tree, different manipulations of detached buttonhole can be viewed side by side. If we look at the deer and unicorn, the slightly larger scale of the stitch allows the viewer to identify the individual stitches and the rows of stitches looping into the previous row of looped stitches. When stitching the detached buttonhole, the embroiderer has the ability to create an entire secondary surface that floats above the ground fabric. Dimensionality can be enhanced by shading forms by stitching underneath, or by padding them out. Additionally, the detached buttonhole stitch may be worked with some sides free, allowing for turned edges, or it may be stitched as fully detachable “slips” that would then have been appliquéd to the surface of the final piece. These slips were stitched to fit the pattern on another piece of fabric, detached, and then moved to this final ground fabric. By stitching the pieces down in this manner, the embroiderer could add folds and layering and create actual draping in the clothing and motifs such as the curtains and Queen’s dress in this similar embroidered picture in the Cooper Hewitt collection. The detached buttonhole stitch allows the embroidery to lift off the ground fabric and to create texture and dimension in magical ways, especially when mixed with the metal threads. Imagine just for a moment how this panel must have shined and shimmered before the silver that is detailing the animals and characters tarnished! Katherine Diuguid is a studio artist specializing in embroidery with a special focus on metal thread embroidery. She lectures teaches embroidery workshops nationally and internationally.